Creating a Google Analytics chart, graph or KPI in WYSIWYG Reports has never been easier than with Compound Charts. Ever wanted to make a pie chart that shows your breakdown of traffic from Organic, Paid and Social channels? What about a line graph that shows sessions over time coming from a particular referrer or a bar chart comparing traffic from major browsers? All of this (and more!) is possible with Compound Charts, which leverage the Dimension Key setting to build any widget you can think of. 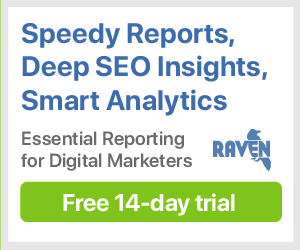 Before you do anything, you'll need to create a new report (or, if you're already well on your way into reporting with Raven, edit an existing report). WYSIWYG Reports gives you a blank canvas to fill with data from just about every tool in Raven, including Google Analytics. Once you've created a report, click the Add button and choose Google Analytics. Click the Create Custom Widget button to start building your first Compound Chart. Metric (1st): This is equivalent to the sections that you'll find in the Google Analytics tool itself. We recommend using All Traffic as your Metric, unless you specifically want to report on a particular type of data, like Landing Pages or Social Referrals. Widget Type: This selects what kind of widget you want to put into your report: a KPI statistic, a Line Graph, a Bar Chart, a Pie Chart or a Table. With the exception of Tables, all of these are customizable using Compound Charts. Metric (2nd): The second Metric option allows you to select the kind of data you want to display: Sessions, Page Views and so on. Additional Metrics: This option only appears for Charts and Graphs. You can select additional metrics beyond what you've selected in the Metric (2nd) menu, so they they display on your chart as well. Advanced Segments (charts/graphs only): Filter your data based on the criteria you've set for your custom Advanced Segments. This is great for excluding traffic from spam referrals, for example. Primary Dimensions: The Primary Dimension slices your metrics data by a particular type. This could be anything from Keyword to Channel to Continent. Table Content: Table Content affects the list of Metrics provided in the Metric (Middle) listing. You can change this to get different data based on Goal Sets, Ecommerce and more. Conversions: The Conversions menu also affects the Metric (2nd) listing. This allows you to report on Ecommerce and Goal conversions. Once you've selected a Goal from the menu, click the Metric (2nd) menu to select your conversion metrics. These will automatically appear in the listing for charts and graphs. Dimension Key: Here's where the Compound Chart magic happens. For a KPI, Chart or Graph, select one or more entries from the Dimension Key menu. This will map those entries (managed by your Primary Dimension) onto the widget of your choosing. Chart Plotting Frequency (charts/graphs only): This setting allows you to pick the data points for your Line Graph or Bar Chart. By default, this is set to daily, but can be changed to monthly or yearly, as well. Line/Bar Chart Metrics (charts/graphs only): Finally, this is where you select or deselect particular lines or bars on the charts. This is useful for removing any information you don't necessarily want to see. Phew! That's a lot to digest, so let's jump into an example of how to create a widget using the settings described above. Let's say that you're tracking the number of people signing up for a newsletter on your website using Google's conversion tracking. You just launched a marketing initiative targeted toward three cities — Chicago, New York City and Los Angeles — and want to report on the number of goal conversions from those cities. Select All Traffic from the Metric menu. Keep the Widget Type set to KPI. In the Conversions menu, select the Goal that you want to report on. We'll call it "Goal 2: Complete Signup." Select City from the Primary Dimensions menu. In the Metric menu, select Complete Signup (Goal 2 Conversions). Finally, in Dimension Key, select each city that you want to combine into the total number. There's a handy search bar for you to use, in case there are a lot of entries to sift through. Click the Submit button, and your widget will appear in your report. Don't forget to give it a Widget Name! Using the same example as before, we can create graphs and charts to compare that data across a timeline. In fact, you don't need to make any changes to the above workflow: just change the Widget Type and Raven will build the chart or graph based on that data. Line Charts are designed for showing changes in data across a period of time. This will add all of your Dimension Key options as four lines: primary, previous (as in, the previous time period), and trendlines for both. Bar Charts are for comparing items against each other. This would most commonly be used in New vs. Returning Users reports, for example. Pie Charts will show each item as a proportion. This is useful for Channel reporting, for example, showing the proportion of people visiting your website from Organic Search, versus Social, Paid Search and Email traffic.